Sift flour and a pinch of salt into a large bowl. Add butter in small pieces. Working quickly, combine the dough into coarse crumbs. Add cold water and form into a ball. Wrap in plastic wrap, transfer to refrigerator, and let rest for approx. 30 - 60 min. In the meantime, cut mozzarella into small cubes and grate Gruyère and Parmesan cheeses. Mix cheeses with sour cream and salt. Season to taste with pepper, smoked paprika and nutmeg. Set aside until needed. Preheat oven to 180°C/350°F. Peel long thin strips from zucchini, eggplant and carrots. Try to make all the same width if possible, halving some lengthwise if needed. Season each slice with salt and pepper. Flour work surface. Remove dough from refrigerator and roll out thinly. Grease tart pan and place dough into it. Trim edges if needed. Using a fork, poke holes into bottom, return to refrigerator, and let rest for approx. 10 min. Carefully place parchment paper on the dough and fill with pie weights or dried beans. Blind bake in the preheated oven at 180°C/350°F for approx. 15 – 20 min. until edges are golden. 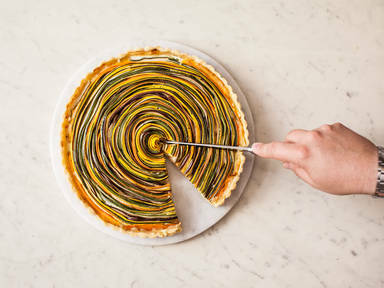 Meanwhile, arrange vegetable slices in a spiral, alternating the colors. Continue until the spiral is almost as large as the tart pan. Increase oven temperature to 190°C/375°F. Remove parchment paper and pie weights from tart pan. Pour cheese filling into tart. Carefully transfer vegetable spiral into the pan, tucking any loose ends in. Brush top of tart with olive oil and bake for approx. 40 – 50 min.